Thomas Jefferson ( April 13, 1743 N.S. – July 4, 1826) was the third President of the United States (1801–1809), the principal author of the Declaration of Independence (1776), and one of the most influential Founding Fathers for his promotion of the ideals of Republicanism in the United States. Major events during his presidency include the Louisiana Purchase (1803), the Lewis and Clark Expedition (1804–1806), and the failed Embargo Act of 1807. As a political philosopher, Jefferson idealized the independent yeoman farmer as the exemplar of republican virtue, distrusted cities and financiers, and favored states' rights and a strictly limited federal government. He supported the separation of church and state and was the author of the Virginia Statute for Religious Freedom (1779, 1786). He was the eponym of Jeffersonian democracy and the founder and leader of the Jeffersonian Republican party (eventually to become known as the Democratic-Republican Party), which dominated the First Party System for a quarter-century. 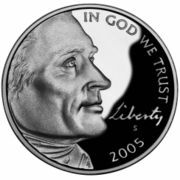 Jefferson served as the wartime Governor of Virginia (1779–1781), first United States Secretary of State (1789–1793), and second Vice President (1797–1801). A polymath, Jefferson was achieved distinction as an horticulturist, architect, paleontologist, author, inventor, and the founder of the University of Virginia, among other roles. President John F. Kennedy welcomed forty-nine Nobel Prize winners to the White House in 1962, saying, "I think this is the most extraordinary collection of talent and of human knowledge that has ever been gathered together at the White House -- with the possible exception of when Thomas Jefferson dined alone." In 1752, Jefferson began attending a local school run by William Douglas, a Scottish minister. At the age of nine, Jefferson began studying Latin and Greek — as well as French. In 1757, when he was 14 years old, his father died. Jefferson inherited about 5,000 acres (20 km²) of land and dozens of slaves. He built his home there, which eventually became known as Monticello. After his father's death, he was taught at the school of the learned minister James Maury from 1758 to 1760. The school was in Fredericksburg twelve miles from Shadwell, and Jefferson boarded with Maury's family. There he received a classical education and studied history and science. In 1760 Jefferson entered the College of William and Mary in Williamsburg at the age of 16; he studied there for two years, graduating with highest honours in 1762. At William & Mary, he enrolled in the philosophy school and studied mathematics, metaphysics, and philosophy under W&M Professor William Small, who introduced the enthusiastic Jefferson to the writings of the British Empiricists, including John Locke, Francis Bacon, and Sir Isaac Newton (Jefferson would later refer to them as the "three greatest men the world had ever produced"). He also perfected his French, carried his Greek grammar book wherever he went, practiced the violin, and read Tacitus and Homer. A keen and diligent student, Jefferson displayed an avid curiosity in all fields and, according to family tradition, frequently studied fifteen hours a day. His closest college friend, John Page of Rosewell, reported that Jefferson "could tear himself away from his dearest friends, to fly to his studies." In college, Jefferson was a member of the secret Flat Hat Club, now the namesake of the William & Mary daily student newspaper. He lodged and boarded at the College in the building known today as the Sir Christopher Wren Building, attending communal meals in the Great Hall and morning and evening prayers in the Wren Chapel. After graduating in 1762 with highest honours, he studied law with his friend and mentor, George Wythe, and was admitted to the Virginia bar in 1767. In 1772, Jefferson married a widow, Martha Wayles Skelton (1748-82). They had six children: Martha Jefferson Randolph (1772-1836), Jane Randolph (1774-1775), a stillborn or unnamed son (1777-1777), Mary Wayles (1778-1804), Lucy Elizabeth (1780-1781), and Lucy Elizabeth (1782-1785). Martha Wayles Skelton died on September 6, 1782. Jefferson was the primary author of the Declaration of Independence and a contributor to American political and civil culture. 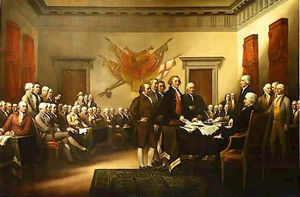 The Continental Congress delegated the task of writing the Declaration to a Committee of Five that unanimously solicited Jefferson, considered the best writer, to write the first draft. In September 1776, Jefferson returned to Virginia and was elected to the new Virginia House of Delegates. During his term in the House, Jefferson set out to reform and update Virginia's system of laws to reflect its new status as a democratic state. He drafted 126 bills in three years, including laws to abolish primogeniture, establish freedom of religion, and streamline the judicial system. In 1778, Jefferson's "Bill for the More General Diffusion of Knowledge" led to several academic reforms at his alma mater, including an elective system of study — the first in an American university. Jefferson served as governor of Virginia from 1779-1781. As governor, he oversaw the transfer of the state capitol from Williamsburg to the more central location of Richmond in 1780. He continued to advocate educational reforms at the College of William and Mary, including the nation's first student-policed honour code. In 1779, at Jefferson's behest, William and Mary appointed George Wythe to be the first professor of law in an American university. Dissatisfied with the rate of changes he wanted to push through, he would go on later in life to become the "father" and founder of the University of Virginia, which was the first university at which higher education was completely separate from religious doctrine. Virginia was invaded twice by the British during Jefferson's term as governor. He, along with Patrick Henry and other Virginia Patriot leaders, were but ten minutes away from being captured by Banastre Tarleton, a British colonel leading a cavalry column that was raiding the area in June 1781. Public disapproval of his performance delayed his future political prospects, and he was never again elected to office in Virginia. 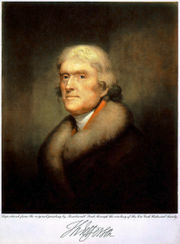 From 1785–1789, Jefferson served as minister to France. He did not attend the Constitutional Convention. He did generally support the new Constitution, although he thought the document flawed for lack of a Bill of Rights. After returning from France, Jefferson served as the first Secretary of State under George Washington (1789–1793). Jefferson and Alexander Hamilton began sparring over national fiscal policy, especially the funding of the debts of the war. In further sparring with the Federalists, Jefferson came to equate Hamilton and the rest of the Federalists with Tories and monarchists who threatened to undermine republicanism. In the late 1790s, he worried that "Hamiltonianism" was taking hold. He equated this with "Royalism", and made a point to state that "Hamiltonians were panting after...and itching for crowns, coronets and mitres". Jefferson and James Madison founded and led the Republican party, which eventually became Democratic-Republican Party (United States). He worked with Madison and his campaign manager John J. Beckley to build a nationwide network of Republican allies to combat Federalists across the country--what historians call the First Party System. Jefferson still clung to his sympathies with France and hoped for the success of her arms abroad and a cordial compact with her at home. He was afraid that any French reverses on the European battlefields would give "wonderful vigor to our monocrats, and unquestionably affect the tone of administering our government. Indeed, I fear that if this summer should prove disastrous to the French, it will damp that energy of republicanism in our new Congress, from which I had hoped so much reformation." Jefferson at the end of 1793 retired to Monticello where he continued to orchestrate opposition to Hamilton and Washington. However, the Jay Treaty of 1794, orchestrated by Hamilton, brought peace and trade with Britain--while Madison, with strong support from Jefferson, wanted, Miller says, "to strangle the former mother country" without actually going to war. "It became an article of faith among Republicans that 'commercial weapons' would suffice to bring Great Britain to any terms the United States chose to dictate." Jefferson, in retirement, strongly encouraged Madison. With a quasi-War with France underway (that is, an undeclared naval war), the Federalists under John Adams started a navy, built up the army, levied new taxes, readied for war and enacted the Alien and Sedition Acts in 1798. Jefferson interpreted the Alien and Sedition Acts as an attack on his party more than on dangerous enemy aliens; they were used to attack his party, most notably Matthew Lyon, Congressman from Vermont. He and Madison rallied support by anonymously writing the Kentucky and Virginia Resolutions which declared that the federal government had no right to exercise powers not specifically delegated to it by the states. Should the federal government assume such powers, its acts under them could be voided by a state. The Resolutions' importance lies in being the first statements of the states' rights theory that led to the later concepts of nullification and interposition. Working closely with Aaron Burr of New York, Jefferson rallied his party, attacking the new taxes especially, and stood for the Presidency in 1800. Consistent with the traditions of the times, he did not formally campaign for the position. Prior to the passage of the 12th Amendment, a problem with the new union's electoral system arose. He tied with Burr for first place in the Electoral College, leaving the House of Representatives (where the lame duck Federalists still had some power) to decide the election. After lengthy debate within the Federalist-controlled House, Hamilton convinced his party that Jefferson would be a lesser political evil than Burr and that such scandal within the electoral process would undermine the still-young regime. The issue was resolved by the House, on February 17, 1801 after thirty-six ballots, when Jefferson was elected President and Burr Vice President. Burr's refusal to remove himself from consideration would create a divide between Jefferson and Burr and lead to Jefferson replacing Burr as Vice President in Jefferson's second term. Jefferson's Presidency, from 1801 to 1809, was the first to start and end in the White House (though at the time it was known as the Presidential Mansion). Jefferson's term was marked by his belief in agrarianism, state's rights, and limited government. He insisted that his Republican party was the true expression of republicanism. Jefferson continued the basic Hamiltonian programs of the national bank, tariffs, and funding the national debt. The Sedition Act expired on schedule in 1801, and one of the Alien acts was repealed. Jefferson systematically identified and removed federalist office holders. He created the military academy at West Point to train a new cadre of republican officers. His floor leader in the House was John Randolph of Roanoke. Jefferson was highly suspicious of the judges appointed by his predecessors; his opinion of good judges was much higher: one of his arguments for a bill of rights would be the power they would give the judiciary He repealed the Judiciary Act of 1801, abolishing numerous courts. He orchestrated the impeachment of one Federalist judge but the Senate refused to convict a more important target, Justice Chase. Jefferson was frustrated when the Supreme Court handed him a nominal victory in Marbury vs. Madison, while also seizing control of the interpretation of the Constitution. 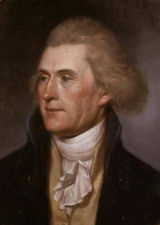 Jefferson continued the Jay Treaty, and kept the Federalist minister in London to continue negotiations on debts and boundaries, which were mostly successful. He commissioned the Lewis and Clark Expedition during his first term. Jefferson was re-elected in the 1804 election. Congressman John Randolph of Roanoke, starting as Jefferson's leader in the House, broke with the president and called for a return to the "principles of '98," and a small weak national government. Randolph was supported by Nathaniel Macon and other Southerners, known as "Old Republicans" (or sometimes called Quids.) They failed to link up with the Federalist minority, and proved an ineffective opposition. Jefferson was easily reelected in 1804. His second term was dominated by foreign policy concerns, as American neutrality was imperiled by war between Britain and France. Throughout his two terms, Jefferson did not once use his power of veto. After leaving the Presidency, Jefferson continued to be active in public affairs. He also became increasingly obsessed with founding a new institution of higher learning, specifically one free of church influences where students could specialize in many new areas not offered at other universities. A letter to Joseph Priestley, in January 1800, indicated that he had been planning the university for decades before its establishment. 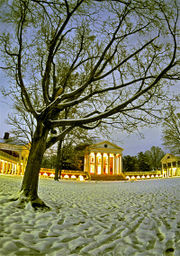 His dream was realized in 1819, with the founding of the University of Virginia. Upon its opening in 1825, it was then the first university to offer a full slate of elective courses to its students. One of the largest construction projects to that time in North America, it was notable for being centered about a library rather than a church. In fact, no campus chapel was included in his original plans. Until his death, he invited university students and faculty of the school to his home; Edgar Allan Poe was among them. Jefferson was six feet, two-and-one-half inches (189 cm) in height, slender, erect and sinewy. He had angular features, a very ruddy complexion, strawberry blond hair and hazel-flecked, grey eyes. In later years, he was negligent in dress and loose in bearing. He was a poor public speaker who mumbled through his most important addresses. There was grace, nevertheless, in his manners; and his frank and earnest address, his quick sympathy (though he seemed cold to strangers), and his vivacious, desultory, informing talk gave him an engaging charm. He was a man of intense convictions and an emotional temperament. "The Sage of Monticello" also cultivated an image that earned him the other nickname, "Man of the People". He affected a popular air by greeting White House guests in homespun attire like a robe and slippers. Dolley Madison, wife of James Madison (Jefferson's secretary of state), and Jefferson's daughters relaxed White House protocol and turned formal state dinners into more casual and entertaining social events. Although a foremost defender of a free press, Jefferson at times sparred with partisan newspapers and appealed to the people. Jefferson's writings were utilitarian and evidenced great intellect, and he had an affinity for languages. He learned Gaelic in order to translate Ossian, and sent to James Macpherson for the originals. As President, he discontinued the practice of delivering the State of the Union Address in person, instead sending the address to Congress in writing (the practice was eventually revived by Woodrow Wilson); he gave only two public speeches during his Presidency. He burned all of his letters between himself and his wife at her death, creating the portrait of a man who at times could be very private. Indeed, he preferred working in the privacy of his office than the public eye. Jefferson was an accomplished architect who was extremely influential in bringing the Neo-Palladian style—popular among the Whig aristocracy of Britain—to the United States. The style was associated with Enlightenment ideas of republican civic virtue and political liberty. Jefferson designed his famous home, Monticello, near Charlottesville, Virginia; it included automatic doors, the first swivel chair, and other convenient devices invented by Jefferson. Nearby is the only university ever to have been founded by a U.S. president, the University of Virginia, of which the original curriculum and architecture Jefferson designed. Today, Monticello and the University of Virginia are together one of only four man-made World Heritage Sites in the United States of America. Jefferson also designed Poplar Forest, near Lynchburg, in Bedford County, Virginia, as a private retreat from a very public life. Jefferson is also credited with the architectural design of the Virginia State Capitol building, which was modeled after the Maison Carrée at Nîmes in southern France, an ancient Roman temple. Jefferson's buildings helped initiate the ensuing American fashion for Federal style architecture. Jefferson's interests included archeology, a discipline then in its infancy. He has sometimes been called the " father of archeology" in recognition of his role in developing excavation techniques. When exploring an Indian burial mound on his Virginia estate in 1784, Jefferson avoided the common practice of simply digging downwards until something turned up. Instead, he cut a wedge out of the mound so that he could walk into it, look at the layers of occupation, and draw conclusions from them. In 1780, he joined Benjamin Franklin's American Philosophical Society. He served as president of the society from 1797 to 1815. Jefferson was an avid wine lover and noted gourmet. During his years in France (1784-1789) he took extensive trips through French and other European wine regions and sent the best back home. He is noted for the bold pronouncement: "We could in the United States make as great a variety of wines as are made in Europe, not exactly of the same kinds, but doubtless as good." While there were extensive vineyards planted at Monticello, a significant portion were of the European wine grape Vitis vinifera and did not survive the many vine diseases native to the Americas. After the British burned Washington, D.C. and the Library of Congress in August 1814, Jefferson offered his own collection to the nation. In January 1815, Congress accepted his offer, appropriating $23,950 for his 6,487 books, and the foundation was laid for a great national library. Today, the Library of Congress' website for federal legislative information is named THOMAS, in honour of Jefferson. In his May 28, 1818 letter to Mordecai Manuel Noah, Jefferson expressed his faith in mankind and his views on the nature of democracy. Jefferson was a leader in developing Republicanism in the United States. The idea was that the British aristocratic system was inherently corrupt and that Americans devotion to civic virtue required independence. In the 1790s he repeatedly warned that Hamilton and Adams were trying to impose a British-like monarchical system that threatened republicanism. Jefferson's vision for American virtue was that of an agricultural nation of yeoman farmers minding their own affairs. It stood in contrast to the vision of Alexander Hamilton, who envisioned a nation of commerce and manufacturing, which Jefferson said offered too many temptations to corruption. Jefferson's deep belief in the uniqueness and the potential of America made him the father of American exceptionalism. In particular, he was confident that an under-populated America could avoid what he considered the horrors of class-divided, industrialized Europe. Jefferson was influenced heavily by the ideas of many European Enlightenment thinkers. His political principles were heavily influenced by the Country party of 19th century opposition figures. He also was influence by John Locke (particularly relating to the principle of inalienable rights. Historians find few traces of any influence by his French contemporary, Jean-Jacques Rousseau. His opposition to the National Bank of the United States was epitomized by his famous quote from a letter to John Taylor, "And I sincerely believe, with you, that banking establishments are more dangerous than standing armies; and that the principle of spending money to be paid by posterity, under the name of funding, is but swindling futurity on a large scale." Jefferson believed that each individual has "certain inalienable rights." That is, these rights exist with or without government; man cannot create, take, or give them away. It is the right of " liberty" on which Jefferson is most notable for expounding. He defines it by saying "rightful liberty is unobstructed action according to our will within limits drawn around us by the equal rights of others. I do not add ‘within the limits of the law’, because law is often but the tyrant’s will, and always so when it violates the rights of the individual." Hence, for Jefferson, though government cannot create a right to liberty, it can indeed violate it. And the limit of an individual's rightful liberty is not what law says it is but is simply a matter of stopping short of prohibiting other individuals from having the same liberty. A proper government, for Jefferson, is one that not only prohibits individuals in society from infringing on the liberty of other individuals, but also restrains itself from diminishing individual liberty. Jefferson's commitment to equality was expressed in his successful efforts to abolish primogeniture in Virginia, the rule by which the first born son inherited all the land. He said in a letter to Colonel Carrington: "I am convinced that those societies (as the Indians) which live without government, enjoy in their general mass an infinitely greater degree of happiness than those who live under the European governments." However, Jefferson believed anarchism to be "inconsistent with any great degree of population.". Hence, he did advocate government for the American expanse provided that it exists by "consent of the governed." We hold these truths to be sacred & undeniable; that all men are created equal & independent, that from that equal creation they derive rights inherent & inalienable, among which are the preservation of life, & liberty, & the pursuit of happiness; that to secure these ends, governments are instituted among men, deriving their just powers from the consent of the governed; that whenever any form of government shall become destructive of these ends, it is the right of the people to alter or to abolish it, & to institute new government, laying its foundation on such principles & organising its powers in such form, as to them shall seem most likely to effect their safety & happiness. Jefferson's dedication to "consent of the governed" was so thorough that he believed that individuals could not be morally bound by the actions of preceding generations. This included debts as well as law. He said that "no society can make a perpetual constitution or even a perpetual law. The earth belongs always to the living generation." He even calculated what he believed to be the proper cycle of legal revolution: "Every constitution then, and every law, naturally expires at the end of 19 years. If it is to be enforced longer, it is an act of force, and not of right." He arrived at 19 years through calculations with expectancy of life tables, taking into account what he believed to be the age of "maturity"—when an individual is able to reason for himself. He also advocated that the National Debt should be eliminated. He did not believe that living individuals had a moral obligation to repay the debts of previous generations. He said that repaying such debts was "a question of generosity and not of right". Jefferson's very strong defense of States' Rights, especially in the Kentucky and Virginia Resolutions of 1798, set the tone for hostility to expansion of federal powers. However, some of his foreign policies did in fact strengthen the government. Most important was the Louisiana Purchase in 1803, when he used the implied powers to annex a huge foreign territory and all its French and Indian inhabitants. His enforcement of the Embargo Act, while it failed in terms of foreign policy, demonstrated that the federal government could intervene with great force at the local level in controlling trade that might lead to war. Jefferson was influenced by Wawrzyniec Grzymala Goslicki's book De optimo senatore, and in his works paraphrased some of Goslicki's phrases from the book. In summary, then, Jefferson was a deist because he believed in one God, in divine providence, in the divine moral law, and in rewards and punishments after death; but did not believe in supernatural revelation. He was a Christian deist because he saw Christianity as the highest expression of natural religion and Jesus as an incomparably great moral teacher. He was not an orthodox Christian because he rejected, among other things, the doctrines that Jesus was the promised Messiah and the incarnate Son of God. Jefferson's religion is fairly typical of the American form of deism in his day. Jefferson used deist terminology in repeatedly stating his belief in a creator, and in the United States Declaration of Independence used the terms "Creator", "Nature's God". Jefferson believed, furthermore, it was this Creator that endowed humanity with a number of inalienable rights, such as "life, liberty, and the pursuit of happiness". His experience in France just before the French Revolution made him deeply suspicious of Catholic priests and bishops as a force for reaction and ignorance. Similarly, his experience in America with inter-denominational intolerance served to reinforce this skeptical view of religion. In a letter to Willam Short, Jefferson wrote: "the serious enemies are the priests of the different religious sects, to whose spells on the human mind it's improvement is ominous." Jefferson was raised in the Church of England, at a time when it was the established church in Virginia and only denomination funded by Virginia tax money. Before the Revolution, Jefferson was a vestryman in his local church, a lay position that was part of political office at the time. He also had friends who were clergy, and he supported some churches financially. During his Presidency, Jefferson attended the weekly church services held in the House of Representatives. Jefferson later expressed general agreement with his friend Joseph Priestley's Unitarianism, that is the rejection of the doctrine of Trinity. 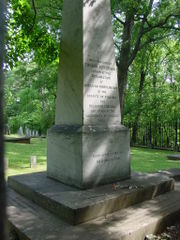 In a letter to a pioneer in Ohio he wrote, "I rejoice that in this blessed country of free inquiry and belief, which has surrendered its conscience to neither kings or priests, the genuine doctrine of only one God is reviving, and I trust that there is not a young man now living in the United States who will not die a Unitarian." Jefferson did not believe in the divinity of Jesus, but he had high esteem for Jesus' moral teachings, which he viewed as the "principles of a pure deism, and juster notions of the attributes of God, to reform [prior Jewish] moral doctrines to the standard of reason, justice & philanthropy, and to inculcate the belief of a future state." Jefferson did not believe in miracles. He made his own condensed version of the Gospels, primarily leaving only Jesus' moral philosophy, of which he approved. This compilation was published after his death and became known as the Jefferson Bible. For Jefferson, separation of church and state was not an abstract right but a necessary reform of the religious "tyranny" of one Christian sect over many other Christians. Jefferson tried re-instating a new religion for all to use, but this idea quickly failed and Jefferson was almost removed from office. Following the Revolution, Jefferson played a leading role in the disestablishment of religion in Virginia. Previously the Anglican Church had tax support. 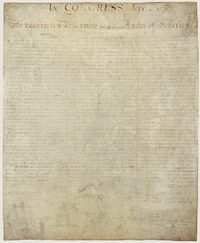 As he wrote in his Notes on Virginia, a law was in effect in Virginia that "if a person brought up a Christian denies the being of a God, or the Trinity …he is punishable on the first offense by incapacity to hold any office …; on the second by a disability to sue, to take any gift or legacy …, and by three year' imprisonment." Prospective officer-holders were required to swear that they did not believe in the central Roman Catholic doctrine of transubstantiation. One of Jefferson’s least well known writings is: "I do not find in our particular superstition of Christianity one redeeming feature.....Millions of innocent men, women and children, since the introduction of Christianity, have been burned, tortured, fined and imprisoned. What has been the effect of this coercion? To make half the world fools and half hypocrites; to support roguery and error all over the world"- Thomas Jefferson, in his Notes on Virginia. Because religious belief, or non-belief, is such an important part of every person's life, freedom of religion affects every individual. State churches that use government power to support themselves and force their views on persons of other faiths undermine all our civil rights. Moreover, state support of the church tends to make the clergy unresponsive to the people and leads to corruption within religion. Erecting the 'wall of separation between church and state,' therefore, is absolutely essential in a free society. During his Presidency, Jefferson refused to issue proclamations calling for days of prayer and thanksgiving. Moreover, his private letters indicate he was skeptical of too much interference by clergy in matters of civil government. His letters contain the following observations: "History, I believe, furnishes no example of a priest-ridden people maintaining a free civil government", and, "In every country and in every age, the priest has been hostile to liberty. He is always in alliance with the despot, abetting his abuses in return for protection to his own." "May it be to the world, what I believe it will be, (to some parts sooner, to others later, but finally to all), the signal of arousing men to burst the chains under which monkish ignorance and superstition had persuaded them to bind themselves, and to assume the blessings and security of self-government". 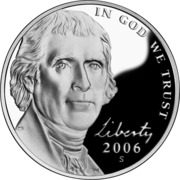 Jefferson commemorated on the 2006 U.S. Nickel. Records show that Jefferson owned many slaves over his lifetime. Some find it hypocritical that Thomas Jefferson owned slaves yet was outspoken in saying that slavery was immoral and it should be abolished. In the Declaration of Independence, he states that " All men are created equal", yet he owned slaves himself. During his long career in public office, Jefferson attempted numerous times to abolish or limit the advance of slavery. According to a biographer, Jefferson "believed that it was the responsibility of the state and society to free all slaves". In 1769, as a member of the House of Burgesses, Jefferson proposed for that body to emancipate slaves in Virginia, but he was unsuccessful. 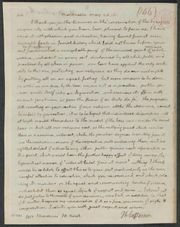 In his first draft of the Declaration of Independence (1776), Jefferson condemned the British crown for sponsoring the importation of slavery to the colonies, charging that the crown "has waged cruel war against human nature itself, violating its most sacred rights of life and liberty in the persons of a distant people who never offended him, captivating & carrying them into slavery in another hemisphere." However, this language was dropped from the Declaration at the request of delegates from South Carolina and Georgia. In this same work, Jefferson advanced his suspicion that blacks were inferior to whites "in the endowments both of body and mind". He also wrote, "Nothing is more certainly written in the book of fate than that these people are to be free. [But] the two races...cannot live in the same government. Nature, habit, opinion has drawn indelible lines of distinction between them." According to historian Stephen Ambrose: "Jefferson, like all slaveholders and many other white members of American society, regarded Negroes as inferior, childlike, untrustworthy and, of course, as property. Jefferson, the genius of politics, could see no way for African-Americans to live in society as free people. He embraced the worst forms of racism to justify slavery." Most of Jefferson's slaves were sold after his death to pay his many debts. Edmund Bacon, the chief overseer of Monticello for twenty years, told his biographer that he believed Jefferson would have freed all his slaves in his will, but was too far in debt. 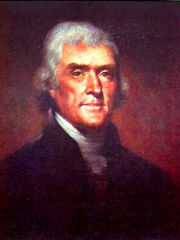 Although Jefferson wrote regarding marriage between blacks and whites, "The amalgamation of whites with blacks produces a degradation to which no lover of his country, no lover of excellence in the human character, can innocently consent," a subject of considerable controversy since Jefferson's time is whether he was the father of any of the children of his slave Sally Hemings. Hemings was likely the half-sister of Jefferson's deceased wife Martha Wayles Skelton Jefferson. The allegation that Jefferson fathered children with Hemings first gained widespread public attention in 1802, when journalist James T. Callender, wrote in a Richmond newspaper, "... [Jefferson] keeps and for many years has kept, as his concubine, one of his slaves. Her name is Sally." Jefferson never responded publicly about this issue but is said to have denied it in his private correspondence. A 1998 DNA study concluded that there was a DNA link between some of Hemings descendants and the Jefferson family, but did not conclusively prove that Jefferson himself was their ancestor. Three studies were released in the early 2000s, following the publication of the DNA evidence. In 2000, the Thomas Jefferson Foundation, which runs Monticello, appointed a multi-disciplinary, 9-member in-house research committee of Ph.D.s and an M.D. to study the matter of the paternity of Hemings's children. The committee concluded "it is very unlikely that any Jefferson other than Thomas Jefferson was the father of [Hemings's six] children." In 2001, the Thomas Jefferson Heritage Society commissioned a study by an independent 13-member Scholars Commission. The commission concluded that the Jefferson paternity thesis was not persuasive. The National Genealogical Society Quarterly then published articles reviewing the evidence from a genealogical perspective and concluded that the link between Thomas Jefferson and Sally Hemings was valid. 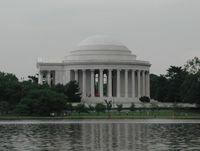 April 13, 1943, the 200th anniversary of Jefferson's birth, the Jefferson Memorial was dedicated in Washington, D.C. The memorial combines a low neo-classicistic saucer dome with a portico. 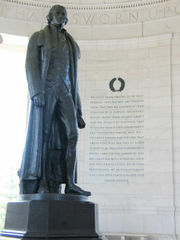 The interior includes a 19 foot statue of Jefferson and engravings of passages from his writings. Most prominent are the words which are inscribed around the monument near the roof: "I have sworn upon the altar of God eternal hostility against every form of tyranny over the mind of man." The Thomas Jefferson Memorial Church ( Unitarian Universalist) is located in Charlottesville, Virginia. July 8, 2003, the NOAA ship Thomas Jefferson was commissioned in Norfolk, Virginia. This was done in commemoration of his establishment of a Survey of the Coast, the predecessor to NOAA's National Ocean Service. Jefferson and John Adams were the only signers of the Declaration of Independence to become Presidents. On July 4, 1826, the 50th anniversary of the adoption of the Declaration of Independence, Adams died at Quincy, after (allegedly) uttering the famous last words "Thomas Jefferson still survives." Unbeknownst to Adams, Jefferson had died five hours earlier. One of the most famous quotations attributed to Thomas Jefferson, "That government is best which governs least", was not from Jefferson at all. The quotation actually came from Henry David Thoreau in On the Duty of Civil Disobedience. A master horticulturist, Jefferson was an early grower of tomatoes (among seventy types of vegetables) when the fruit was considered dangerous. Jefferson had a lisp and preferred writing to public speaking partly because of this. Jefferson kept two bear cubs given to him by Lewis and Clark housed in cages on the White House South Lawn. Likening himself to the third president, President George W. Bush remarked that Jefferson invented more words than any other president. He was portrayed by Ken Howard in 1776 and Nick Nolte in Jefferson in Paris. 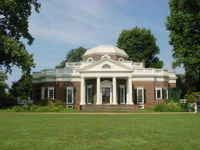 The Thomas Jefferson Centre for the Protection of Free Expression chose Jefferson's name as embodying free speech, and it often works with the Jefferson-founded University of Virginia.